A boat is anchored overnight. The anchor, which was bought five years ago, is the wrong type and too light, but it has worked fine in the past five years because it's never been put fully to the test. There's a new crewman on the boat who has not been told about the watch rota. He should have been on watch, but fell asleep early, having had slightly too much to drink. The captain is ashore at a party. During the night the wind rose to gale force and the boat started to drag its anchor. No one noticed until it hit the rocks and the hull was cracked. 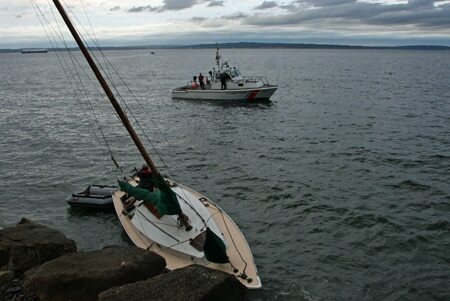 The boat took on water and foundered on the rocks, but the crew were able to get ashore and no one was injured. If you were to investigate this incident you would look for what has changed and what has failed? So, when you are looking for changes and failures, remember not all changes are failures, and not all failures are changes! Once the investigation is complete and we know what went wrong, we want to put things right and prevent the same incident happening again. That's the bottom line, but we also want to stop other related failures occurring, so that our recommendations result in an all-round improvement of the running of this boat. Many take the view that recommendations in the form of SMART actions should focus only on the Root Causes. But this is not true. You can and should make recommendations on Immediate Causes and Underlying Causes (the behaviour of the crew), as well as Root Causes (the behaviour of the captain). What can we do to ensure the same incident does not occur again? Well, we could buy a better anchor. That would be quick and easy to do, so long as the owner of the boat had sufficient funds, after paying for the recovery of the boat and the repair of the hull! SMART actions are only any good if they are reasonable, relevant and affordable. But a new anchor is only part of the problem. It seems that the captain and the crew need a some re-training. We could recommend that this takes place, but even if it does take place we can't be absolutely certain that the crew will not be tempted to go drinking again, and that the captain will curtail his social life. One would hope that the advice given to the captain will result in a better run boat, but it's only an expectation. Fixing Root Causes takes time, and you often can't be certain that the fixes will result in improvements. So why bother? Simply because by altering the behaviour of the people (and it's always people) at the Root Cause of a problem, your remedy will have wide implications and improve many other related aspects of behaviour in any organisation. The new anchor will stop the boat drifting in a gale, certainly, but it won't have any impact on the running of the boat by the captain and the crew. And what about the gale? Well we can't do anything about that, we just have to plan for it. Being proactive is so much better than being reactive.